Lao Airliner Crash That Killed 49 Blamed On Bad Weather : The Two-Way One U.S. citizen was among the passengers in the turboprop that crashed into the Mekong River in southern Laos on Wednesday. Soldiers stand next to pieces of a Lao Airlines plane on Thursday after it crashed into the Mekong River near Pakse, Laos. The crash of a turboprop in southern Laos that killed all 49 people aboard was caused by a violent storm that prompted the pilot to miss a runway and careen into the Mekong River, authorities say. "Upon preparing to land at Pakse Airport the aircraft ran into extreme bad weather conditions and was reportedly crashed into the Mekong River," the Laos Ministry of Public Works and Transport said in a statement. 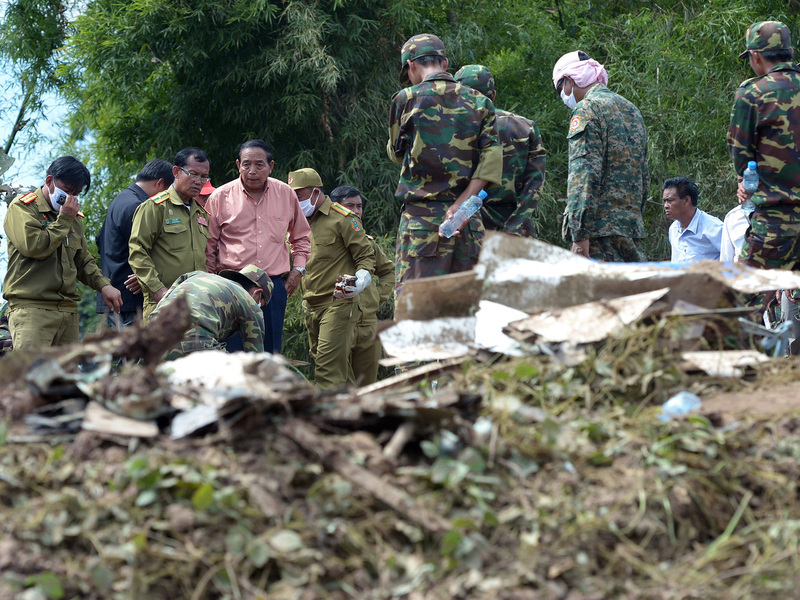 The Lao Airlines' ATR-72 had 44 passengers aboard. In addition to 17 Lao nationals, the flight included several passengers from France, Australia and Thailand; three from Korea; two from Vietnam; and one person each from the United States, Canada, Malaysia, China and Taiwan. Five crew members were also killed. The state-run news agency of Laos quoted an eyewitness to the crash as saying that the plane "appeared to be hit by a strong wind, causing its head to ascend and pushing it away from the airport area." "He ruled out finding survivors. 'There is no hope. The plane appears to have crashed very hard before entering the water.' "
"Lao Airlines, the national airline of the impoverished and landlocked nation of six million people, operates domestic as well as international services. Its fleet includes six aircraft of the type involved in the crash. "Paske, the capital of Champasak province, opposite the Thai province of Ubon Ratchathani, is the largest city in southern Laos. "The area is a popular destination for tourists who visit coffee plantations of the Bolaven Plateau and a former royal principality."